The question if I knew what was depicted on the miniatures of the 1893 Caucasus Egg made me look at them closely for the first time. I loved the Egg and admired the little paintings but I never gave the miniatures a second look as I thought all was already known, but to my surprise, I was wrong and I learned a lot during my search for answers! Here are the four miniatures, presented as they appear behind the numerals on the little oval doors bearing the ciphers 1-8-9-3, the year the Egg was presented to Empress Marie Feodorovna. Although the Imperial Caucasus Egg is dated 1893 and was presented to Empress Marie Feodorovna in 1893, the signed and dated miniatures were already painted in 1891 by miniaturist Konstantin Krijitski (1859-1911). In my Fabergé Egg books , these four miniatures are described as views of the "Imperial hunting lodge at Abastuman". The story goes that when Grand Duke George Alexandrovich fell ill with tuberculosis, he retreated to the Caucasus mountains and spent the rest of his life there until he died in 1899, at the young age of only 28. However, there was no Imperial hunting lodge in Abastuman. 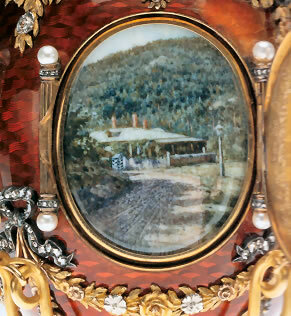 The two houses depicted on the miniatures of the Caucasus Egg were especially built for Grand Duke George Alexandrovich when Abastuman was chosen as the place to live for him. 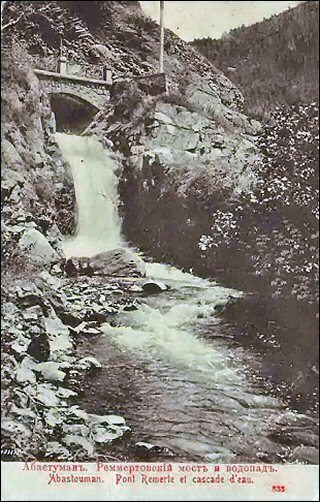 There is quite a lot of information on Abastuman (now in the country Georgia) and the Romanovs in Russian and Georgian languages, but not much in English. So I thought it might interest other Fabergé Egg lovers to know a little bit more about the background of this Egg and the Grand Duke whose name is so closely associated with it. In 1891, Grand Duke George Alexandrovich was traveling together with his brother the Tsesarevich Nicholas Alexandrovich on a ship voyage to the East when he fell ill and had to travel back to Russia. His illness in the end turned out to be tuberculosis and a place for him to live was sought. Eventually Abastuman, 1300 meters high in the Caucasus mountains was chosen for its clean air and miracle waters. Abastuman (Abastumani or Abas-Tuman at the time 1891) was already known as a spa or kurort. 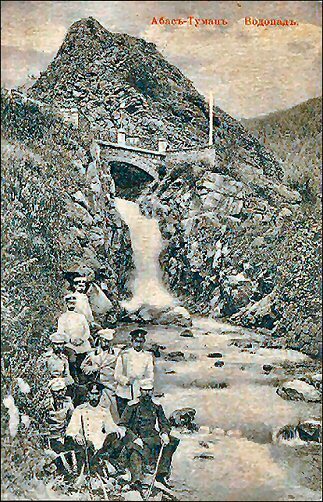 Among the locals since ancient times it was known that there were medicinal hot springs, and people from surrounding villages gathered on carts and wagons to be cured. The "patients" were arranged in tents near the river and treated by "taking a bath". Abastuman already had a special bathhouse where people could "take the water". 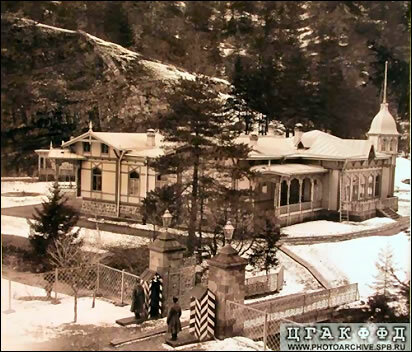 So in 1891, Empress Marie Feodorovna and her son traveled to the mountain village where one of the best mansions was hired for her and the Grand Duke. 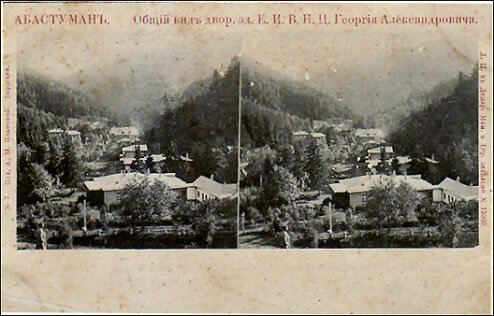 A plot of land was already bought by Dr. Remmert at the top of Abastuman, near the river and the then famous Caucasus architect, Otto Simanson, quickly build the so-called palaces, two wooden and one stone. The Grand Duke lived there under supervision of doctors, who lived immediately next to the "palace". At the time there was no cure for tuberculosis, it was believed that living in as much open air as possible, benefited the patients. Wood as building material was chosen for the summer house since it was thought living in a wooden house was healthy for body and soul. 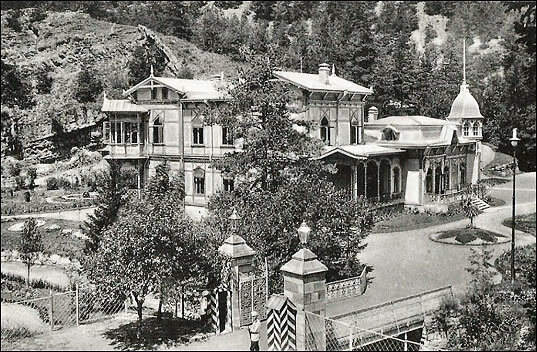 Life in Abastuman changed dramatically when it was chosen as the home for Grand Duke George Alexandrovich. Probably a significant role in this was played by the Grand Duke Mikhail Nikolayevich, the governor of the Caucasus. He lived for many years in the Caucasus, where four of his seven children were born. 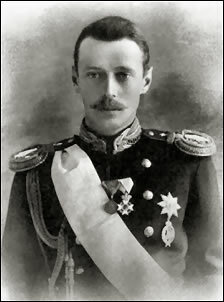 His son, Grand Duke Alexander Mikhailovich, who was born there too, in 1894 married the Grand Duke's sister Grand Duchess Xenia Alexandrovna and they had a house nearby. 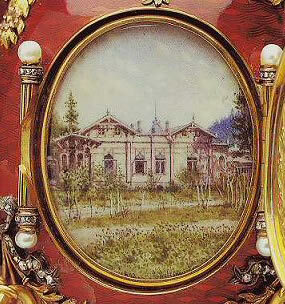 The house on the miniature behind the little oval door numbered "1" must have been Grand Duke George's "Winter Palace". I have found only one image that has a building with similar chimneys, the building on the postcard I found on Delcampe.Net. The Russian text reads "Abastuman Overall view of the House of His Imperial Grand Duke George Alexandrovich". Anyone who can help with better identifying this image is most welcome and will certainly get the credit! The water and its treatment obviously were very important in Abastuman. Already in 1886 an electro-therapy department with two bathrooms was opened. The water came directly from one of the three wells in the village. 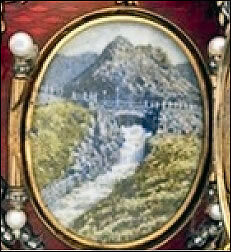 The Remmert Bridge over the waterfall depicted on one of the miniatures is called after Dr. Remmert who was born in Saint Petersburg in 1835 and died in Abastuman in 1902 and is buried there. 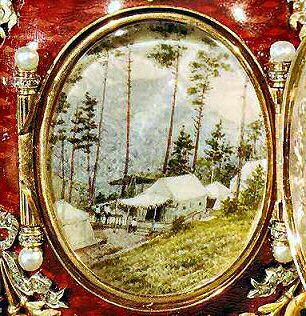 The miniature behind the little door with cipher "9" shows some tents in the woods. These probably were in use in 1891 when Krijitski painted the miniature. 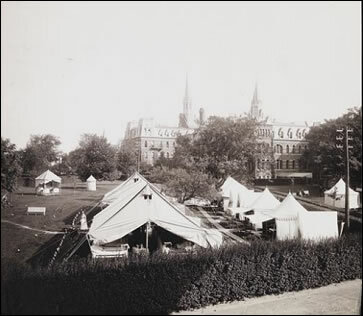 The tents puzzled me somewhat until I read about the "open air treatment" for tuberculosis. As stated before, at the time there was no cure for this illness. Although Robert Koch (1843-1910) had identified the cause for tuberculosis in 1882, only in the next century drugs became available for treatment. 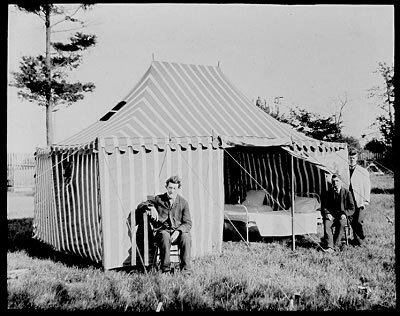 Till then, it was generally believed fresh air, rest and sunshine were the major components in treating tuberculosis and a tent was the closest thing to living outside. The balconies of hospitals where the sick were treated in the open air are a more familiar sight to most of us. In 1894, after the sudden death of Alexander III, Nicholas II ascended the throne. He had no heirs yet, so his younger brother became the heir and Tsesarevich. George’s presence in Abastuman made the resort even more popular and many nobles were visiting the village just to be noticed by the young heir. In Abastuman the Grand Duke was visited by all members of the emperor’s family, including his mother Marie Feodorovna and Emperor Nicholas II himself. Miniature "3"- The "Summer Palace"
The miniature behind door "3" of the Caucasus Egg shows the "Summer Palace" in its early state. There is only one floor. This is how the house was painted on the miniature. Later the house was modified and a second floor was added. It is obvious the house on the right is from a later date, which you can also see on the trees in the garden. The Grand Duke suddenly died on Monday June 28, 1899, while he was riding on his motorcycle. He was later laid to rest in the St. Peter and Paul Cathedral in St. Petersburg, near his late father, Alexander III. The Imperial Caucasus Egg remains a silent witness of the last years of his short life. For many great images of Abastuman and the funeral processions for the Grand Duke, click here and here! For other more general images see the websites listed below under sources. All other images courtesy the websites listed under sources.